A new trend of 9/11 Middle Readers has emerged with Towers Falling being the second, preceded by Nine, Ten: A September 11th Story which was published on June 28, 2016 and followed by All We Have Left, published on August 9, 2016. Given how deftly Rhodes covered Hurricane Katrina in Ninth Ward, I expect this will be my favorite. However, I haven't read the other two yet, so I can't say definitively. She does a good job of making the story accessible to kids. 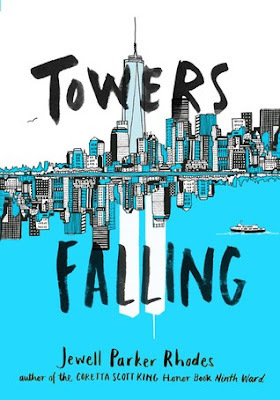 Rather than jettisoning the reader back to when the towers actually fell, she positions us on the fifteenth year anniversary with a fifth grade class that has a view of the Manhattan skyline learning about one happened. I cared just as much about the frame story as I did the historical significance. Dèja is homeless and starting a new school, quickly making friends with Ben who just moved to Brooklyn from Arizona due to an impending divorce and Sabeen, who is Muslim. Sabeen's character was a very nice way of dealing with the whole Muslims-are-not-synonymous-with-terrorists issue. As Dèja learns more about the tragedy, she realizes that it had more personal impact than she had thought: her dad had survived 9/11 himself, but is now shell-shocked and out of work. That said, there were a few qualms I had about the story. One was that even though the school Dèja attended was supposed to be teaching about 9/11, Dèja and her friends had to find out most of the nitty-gritty detail themselves. I felt like this was done mostly to protect the plot arc, but I hate it when the enfolding of a plot is noticeably altered for the sake of a literary device. Another problem I had was that Rhodes kept reassuring us that we are all a community of people who belong together because we're all Americans. I strongly believe that Nationalism is one of the problems that prevents the world from getting along peaceably. As long as we are otherizing a group of people, we are going to find excuses to be reductionist towards them. Rhodes does mention that the towers symbolized Capitalism to the terrorists, and it probably would have reduced her credibility to have long explanations. But this returns to the afore-mentioned problem of the kids having to find out too much of the information on their own with no guidance from the adults in their lives. I've taught kids who were born after 2001 to whom 9/11 is ancient history. Rhodes and the other authors are tackling a much-needed topic and she does a good job of not overwhelming her young audience. My favorite part was when Dèja and Ben go to the Memorial and observe the building footprints as "horrible beautiful." Dèja worries that her dad has only been left with the horrible. Maybe Dèja can help him find the beautiful too.